Michelle King started as a student aide at L.A. Unified in 1978. Michelle King, center, receives applause from L.A. Unified board member Scott Schmerelson, left, and board President Steve Zimmer after being named on Monday as the district's new superintendent. For months, a high-profile head-hunting firm searched the nation for a new superintendent of the Los Angeles Unified School District. On Monday evening, the Board of Education gave the job to a candidate who was part of the district all along: Chief Deputy Supt. Michelle King.Some education experts cheered the decision. Others winced. Michelle King, center, is flanked by daughter, Colleen, left, and her mother, Ivolene Brewster, right, during the recent Women on Target awards. 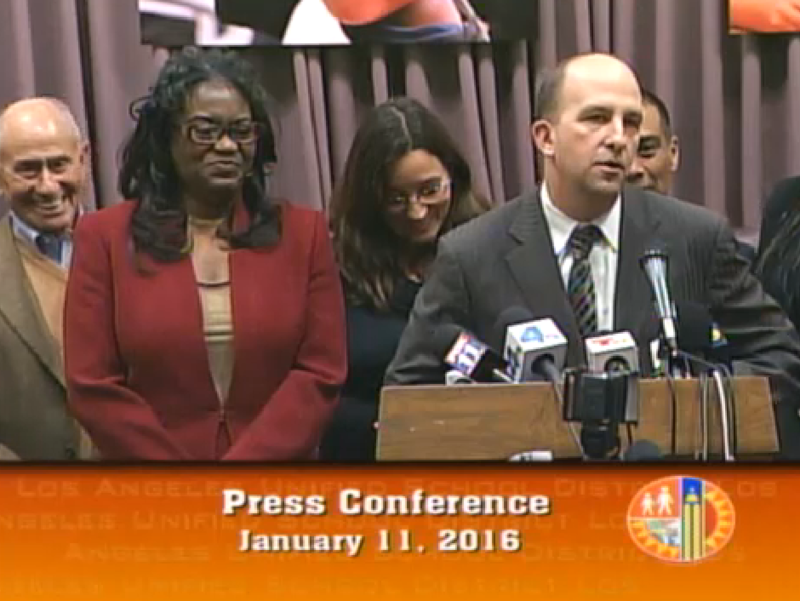 King was named LAUSD superintendent on Monday, Jan. 11, 2016. A veteran administrator was tapped to lead the nation’s second-largest school system on Monday, as the Los Angeles Unified School District board chose a longtime teacher and principal to oversee the education of more than 600,000 school children. 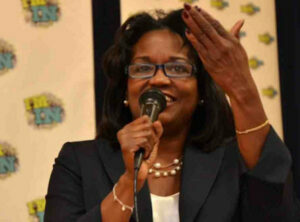 LAUSD Deputy Superintendent Michelle King, 54, became the first African-American woman to hold the superintendent post. King is a Los Angeles native and attended L.A. Unified schools — Century Park and Windsor Hills elementary schools and Palms Junior High — before graduating from Palisades High School. King taught for 31 years as a science and math teacher, beginning at Porter Middle School in Granada Hills. That’s right. The new superintendent of the massive district is a Valley Girl. From there, she became the coordinator for the math, science and aerospace magnet at Wright Middle School in Westchester, and then went on to become assistant principal and principal at Hamilton High School in Cheviot Hills. Michelle King was unanimously selected Monday to be the superintendent of Los Angeles Unified – the first African-American woman, and the first woman in more than 80 years, to head the nation’s second-largest school district. Newly appointed Superintendent Michelle King is joined by Board Members, from left, Mónica Ratliff, Richard Vladovic, Scott Schmerelson, President Steve Zimmer, George J. McKenna III, Móníca Garcia, Ref Rodriguez and retired Superintendent Ramon C. Cortines. King, 54, attended Los Angeles Unified schools and dedicated her 31-year career to the District as a teacher and administrator. Most recently, she was the chief deputy superintendent under recently retired schools chief Ramon C. Cortines. Deputy Superintendent Michelle King has been selected as the new superintendent of the Los Angeles Unified School District, the Los Angeles Board of Education said on Monday. King, 54, who has been the school district's No. 2 administrator under the last two superintendents, replaces Ramon C. Cortines, whose retirement took effect Jan. 2. Michelle King speaks after being named the new superintendent of the Los Angeles Unified School District, the nation's second largest school district, on Monday, Jan. 11, 2016. The Los Angeles Unified School District has named Michelle King its new superintendent, officials announced on Monday. The board of education voted unanimously to name King the new superintendent of the nation's second largest school district. The LAUSD chooses a new superintendent, Michelle King. "What a historic moment this is," LAUSD board President Steven Zimmer said. "A daughter of our city, a student and graduate of LAUSD, a teacher from our schools, a principal from our system, a leader of our community will now take the helm with us together to lead this district, our schools and our community for breakthroughs in public education for the students that need us the most." After months of speculation and a closed-door national search process, the seven members of the Los Angeles Unified Board of Education announced on Monday that they have selected long-time district administrator Michelle King to be the district's next superintendent. In brief remarks to reporters after the announcement, she thanked the board for "their confidence and support" and as the first African American woman to lead the district, sees herself as a role model for what can be achieved. The Los Angeles Unified School District turned to a home-grown educator to lead the nation's second largest school system. After a three-month nationwide search, the LA Unified school board today kept it all in the family, naming Michelle King, a district teacher and administrator for nearly 30 years, to serve as its new superintendent. She succeeds Ramon Cortines whom she served as chief deputy until he stepped down last month. The 54-year-old King becomes the first black female to ever run LAUSD and the first woman at the helm of the district since 1929. LAUSD school board President Steve Zimmer introduces Michelle King as the district’s new superintendent. Michelle King, the new LA Unified superintendent, is a district “lifer,” having worked all of her professional career in the district as a teacher, principal, magnet coordinator and top administrator. She also is a product of LA Unified, having attended Palisades High School. King, 54, served as senior deputy superintendent of school operations under former Superintendent John Deasy from 2011 to 2014, and was given the title chief deputy superintendent of schools when Ramon Cortines took over shortly after Deasy resigned. In both roles she was effectively the No. 2 administrator for the district. 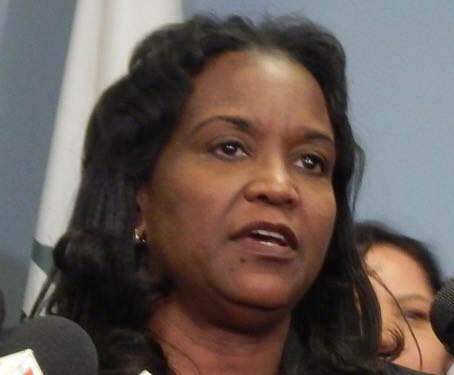 Los Angeles Unified School District Deputy Superintendent Michelle King is named the district's next superintendent by members of the board of education during a news conference Monday in Los Angeles. At left is former Los Angeles Unified School District Superintendent Ramon Cortines. LOS ANGELES – The Los Angeles Unified School District selected Michelle King as its next superintendent Monday, making her the first woman in more than 80 years and the first black woman ever to lead the nation’s second largest school district. The district’s board announced its unanimous vote at the end of a closed-door session capping a month of meetings and interviews to select a finalist. After a months-long national recruitment effort, the Los Angeles Board of Education on Monday picked an insider — Deputy Superintendent Michelle King — as the district’s new superintendent. King, 54, rose from the ranks and was a well-respected principal before joining the administration. Board members said that she impressed them in their long interviews behind closed doors and think that her inside status will help her deal with the district’s problems without delay, according to the Los Angeles Times. Eds: ADDS statement from Mayor Eric Garcetti. The board is expected to finalize her contract at its meeting Tuesday. The selection of King was unanimous. as the interim leader of the district since Cortines stepped aside. High School and attended UCLA. assistant principal and principal at Hamilton High School in Cheviot Hills. under Cortines following Deasy's departure.